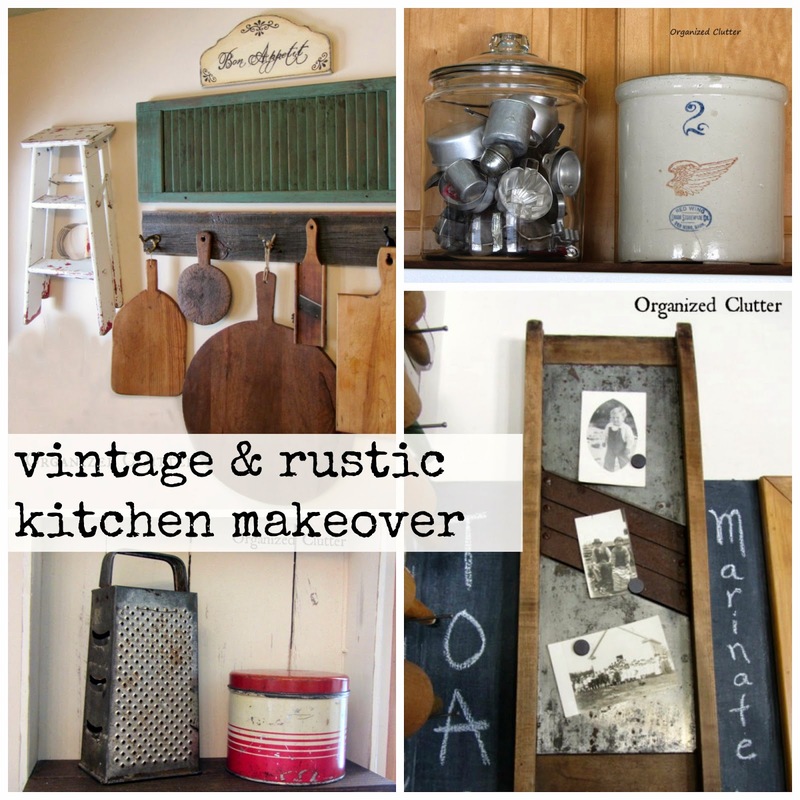 I am a fan of rustic farmhouse style, especially in the kitchen. BUT, does it have to be white on white? I look outside at WHITE for almost six months a year. I need a little color INSIDE. 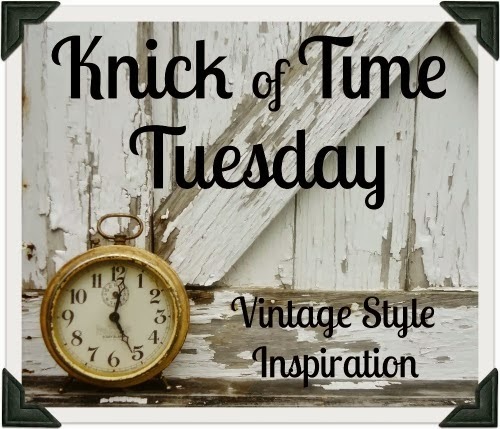 I am a huge fan of Angie's kitchen at Knick of Time Interiors. Fun, cool, inexpensive...awesome. Take in this this kitchen tour if you haven't already! I think you will love it. Then there's Dru's farmhouse kitchen at The Country Farm Home. 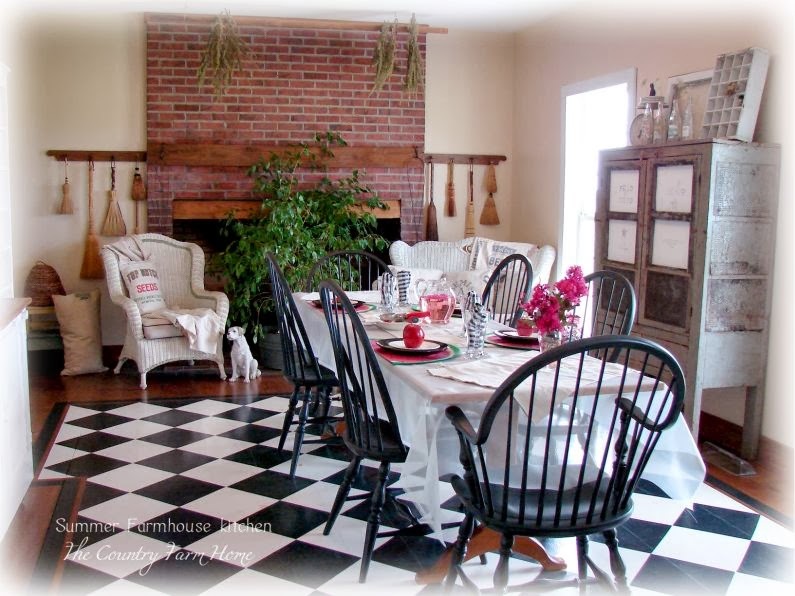 Dru has a spectacular painted checkerboard floor, and super fun vignettes. Part two of her kitchen tour is HERE. Back to northern Minnesota and my small kitchen. I gutted my kitchen in 1991, and put in new cabinets. Light wood toned birch cabinets. In the meantime, I have changed my kitchen decor. I have taken down my small trinket shadowbox, and replaced it with hanging cutting boards and a chippy step stool. And the radiator shelf was re-decorated too with a meat grinder and vintage cook books. This section of wall above my corner kitchen built in was painted with Rustoleum black chalk board paint. I added my rolling pin shutter display, and this kraut cutter magnetic photo holder. I added an empty frame with "EAT", and a Mod Podge transfer clipboard. All the chalked words are cooking verbs. 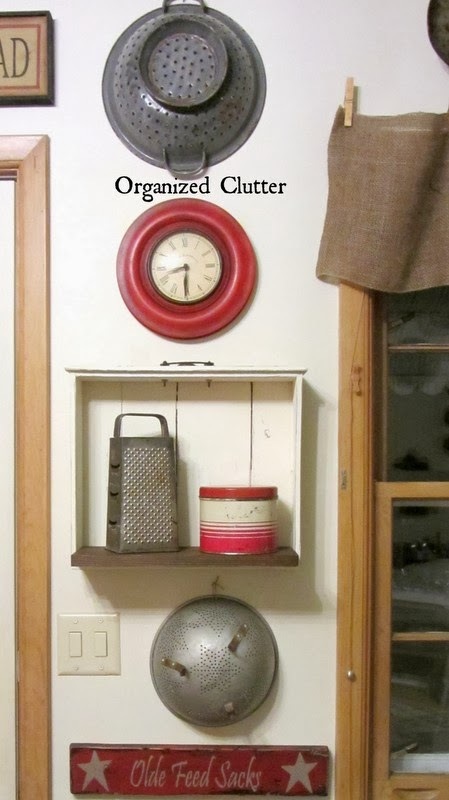 Here are the bottom corner built in shelves with bowls and other vintage kitchen items. The door to the right is my laundry room. Luckily with a small kitchen I have tons of cabinets for storage in my attached laundry room. I went with the wooden bread box. I painted the black bread box with ASCP old white. I also painted the black over the sink shelf old white. 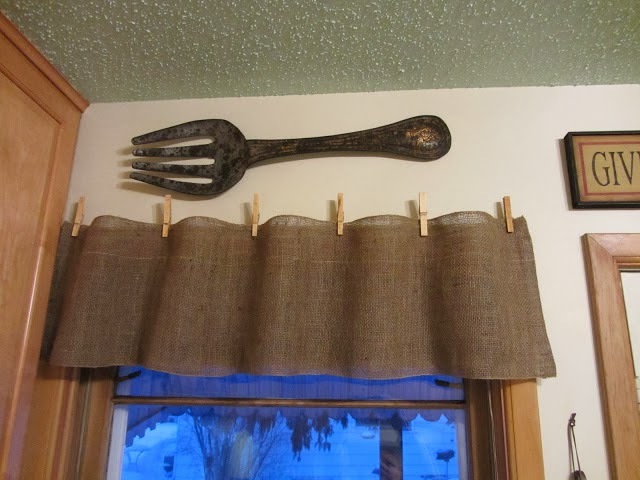 I am still using my cheap and easy clearance burlap garland valances. The table and TV area of the kitchen. I put a TV in when my kids were little to keep them from eating in the living room, but my husband still uses the TV at breakfast and lunch so it stays for now. I hope you like my changes! I sure do like the changes! My fav is the ganging cutting boards. I see several things I really like and I'm pinning them for my lake house re-do! Looks great, Carlene! Love the new look! I like your changes, Carlene. The chalkboard wall is a fun new addition! Your breadbox looks great with its new white finish! How pretty! I have to agree, as pretty as the white on white is, I love color and think your kitchen is a perfect combo of color and farmhouse :) Thank you for sharing! Wow! You did a great job Carlene! 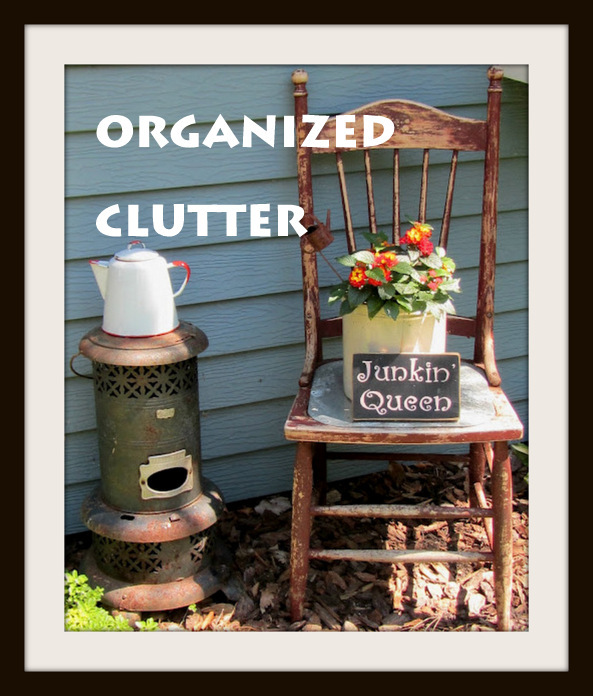 I especially love the chalkboard corner... great job, so many awesome vintage finds! Wow! I can't tell you how much I like that whole chalkboard wall corner deal! Fantastic! Makes me want to go check to see how long all of the rolling pins I've collected are!! Carlene...I love your kitchen and it says rustic farmhouse for sure!! I just love your cutting boards and the little step ladder on the wall. I have a farmhouse feel to my kitchen too and my cabinets are hickory...I just love how the whites pop off of the wood tones. Love what you did with the rolling pins! I love your rolling pin display and cutting board display! Love the look and your changes, Carlene...especially your wonderful cutting board display! Love all the little things you've done in your kitchen! The shutter with the rolling pins caught my eye...as did the chalkboard wall and open shelving. I was reminded of Amy's kitchen at "All Things Home"
and I like seeing how you work your magic in your kitchen. It's so cute and cozy Carlene! And I love all your special collections, great job! Are you warming up at all? We are supposed to be 40 today, will feel like 60! I need color too, so much white where we live. Nice change Carlene ... lots of interest going on in your kitchen ... love it all ... especially the cutting board display and the chalk board corner. You are so well organized. I like the cabinets too. I love your kitchen and I love that little eating nook. So adorable. Those breadboards are awesome. 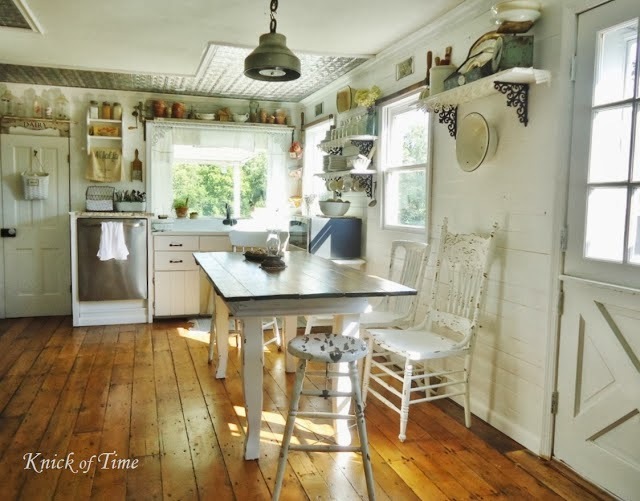 Your kitchen is so full of charm and vintage goodness, Carlene! I really like the chalkboard painted wall and your hanging breadboards. Doesn't it feel good to make simple changes for a fresh look? I love your changes Carlene! I love the little open shelf under the cool chalkboard area too. (Especially love the cooking verbs.) I want a TV in my kitchen! Love the kitchen redo and I would so paint the cupboards white while hubby was at work, it would make your table pop so nicely. Really love everything but that little shelf at the kitchen sink is perfect. Must see if I can make one of those!